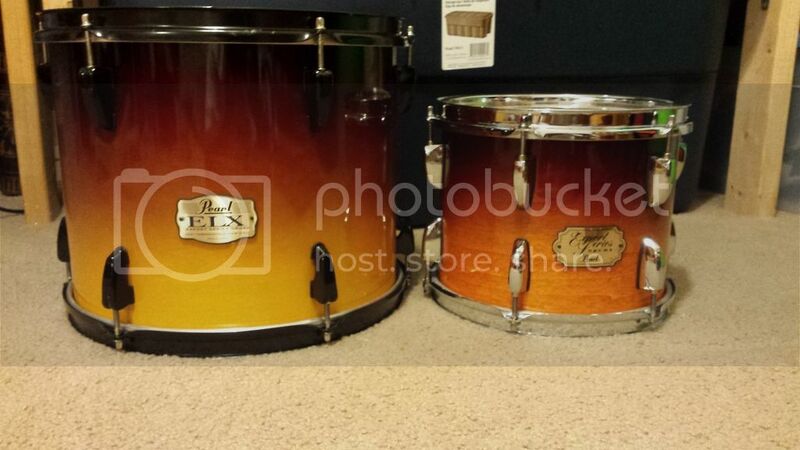 1st drum on the left looks to be color #294 Amber Fade w/black hardware circa 2006. 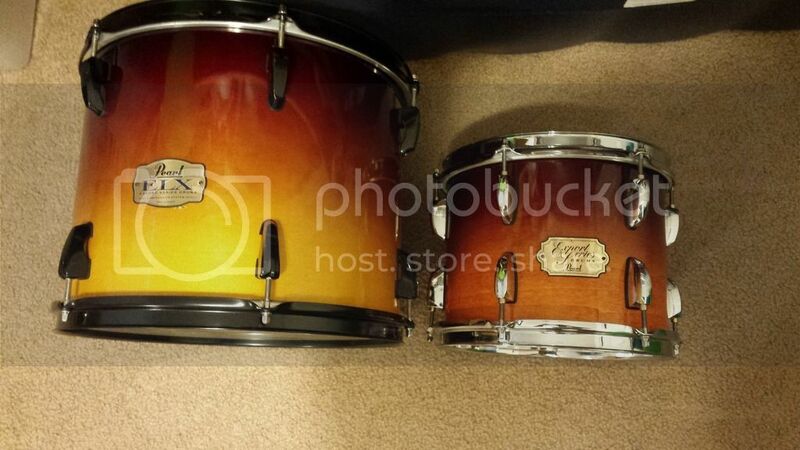 The smaller drum on the right looks to be #274 Amber mist circa 2002-2003. You got it sorta right. Thanks guys. I'm looking for a matching 10 to go next to my Amber Fade 12, but the closest thing I found was this Autumn Fade. I bought black lugs and hoops off Ebay, and now everyone I ask thinks that all the drums match. Question: How would one go about ordering an EXX 18" x 16" floor tom? If possible, that is. There really is a Kalamazoo! It's easy, and any Pearl dealer can order it for you. Tell them you want to order EXX 1816F/C and let them know which color you want. The dealer will call Pearl to check availability to let you know about how long it will take. List price is $280, so expect to pay somewhere around $180, give or take (plus possible shipping charge and local sales tax). I own or have owned drums and cymbals made by every major manufacturer. My go-to kit is a DW Collectors series set. It's easy, and any Pearl dealer can order it for you. Tell them you want to order EXX 1816F/C and let them know which color you want. The dealer will call Pearl to check availability to let you know about how long it will take. List price is $280, so expect to pay somewhere around $180, give or take (plus possible shipping charge and local sales tax). Can anyone tell me what years the ELX were produced? I bought mine used 10 years ago and have used the for hundreds of gigs. I call em My Working Kit.. I'm just wondering just how old they are. Oh my opinion on the head preference. I use Remo Pinstripes on my Toms and Evans on my Kick & Snare. I'm just wondering just how old they are. i bought back in 2006 a Pearl Drum set EXR, but unfortunatly i sold them in 2012. I want to buy a new one and i want the same quality as the old EXR. I can`t find those anymore, what it the new set that is equal to the old EXR? EXR's had a poplar shell. Not sure what else separated them from standard Exports. Current Exports EXX and EXL have a poplar/asian mahogany blended shell. So the shells are pretty close. The new Export mounting system is an improvement over the ISS mounts of the EXR kit as well. There aren't any sets in the current Pearl lineup that have only poplar shells, as far as I know. The Decade Maples would be the next step up. But of course, they are thinner, all maple shells. To clean your gold jewelry, start by mixing a few drops of liquid dish soap into a bowl of lukewarm water. Then, put your gold jewelry in the water and let it sit for 30 minutes. After 30 minutes, take out your jewelry and gently scrub it with a clean soft-bristled toothbrush. What does export file mean? Answer:In a personal computer application, to export is to convert a file into another format than the one it is currently in. Once the file is exported to the desired format (specified in its file name suffix), it can be opened and worked on by an application that recognizes and uses this format.